The Avengers: Infinity War Part 1 has finally started production, and there is more than a good chance that we finally will see Thanos finally don the Infinity Gauntlet. In fact, many of the Marvel movies that have already come out have been leading us to this latest Avengers movie. 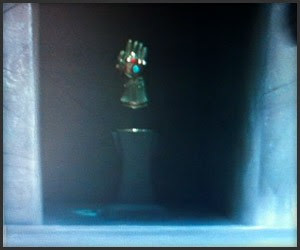 However, this won't the first time we've seen the Infinity Gauntlet on the big screen. If you remember, it was shown ever so briefly in Thor: The Dark World. In the movie, we can see it in a scene where it appears to already have all of the Infinity Gems, but, from the Guardians of the Galaxy and Avengers: Age of Ultron movies, we know that at least two of the Gems shouldn't be. But, that's a debate for another blogger to tackle. 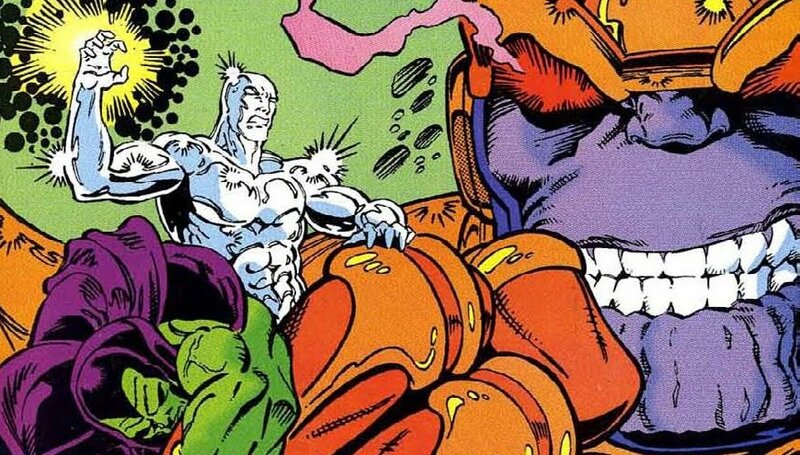 I'm here to talk about the first appearance of the Infinity Gauntlet in comics and it just so happens to appear in Silver Surfer Vol. 3 #44. 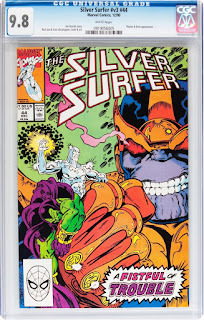 There's at least one source that claims Infinity Gauntlet #1 is it's first appearance, but since that book came out nearly seven months after this issue of Silver Surfer, I can tell you that that source is not correct. In the two part story The Thanos Quest, as Thanos was gazing into the Infinity Well, he learned of the Soul Gems and the powers that they possessed. He also learned where he could find them. One by one, he defeated the owner of the Gems, gathered them together, and, using the powers from them, became an all powerful being. 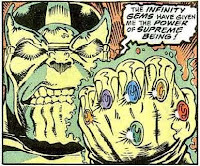 It was in this mini series that Thanos started to refer to the Soul Gems as Infinity Gems. 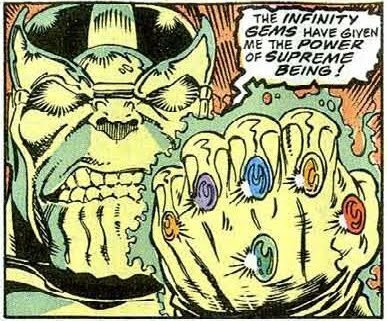 We never see the Gems mounted on a Gauntlet in the series. Thanos' reason for acquiring the Gems was to become an equal to his beloved, Death. But, after acquiring them, be became more powerful and, in her eyes, was her superior. This isn't a highly sought out key issue at this time. It is started to get noticed a little more now for its key issue status. There are only 327 copies listed in the CGC census to date, but I expect that to change once this issue starts to increase in value and more people feel it's a worthy candidate for grading. Most of the copies listed in the census are of very high grade. Of those 327, 220 are graded a 9.4 NM or higher, with 83 of those graded 9.8 NM/M. There's not a lot of sales data before the movie hype hit. This wasn't a comic that was on anyone's radar at that point. You could snag a high grade copy for a fraction of what they are going for now. Back in late 2013, a CGC 9.8 NM/M copy sold on eBay for $79.99, and a CGC 9.6 NM+ sold for less that twenty bucks. Fast forward a couple years to 2015, once the hype hit, 9.8's started to sell for around the $300 mark and have pretty much hovered in that range since then. It did break the $400 mark between May and Sept. of 2016, but has settled back to where it was. If you're looking for something in the sub $100 range, you'll probably be looking at 9.2 NM- or 9.4 NM copies, and if you're really lucky, you might be able to snag a 9.6 NM+, but that's not very likely any time soon. If you're looking for an even cheaper option, there are still a ton of raw copies out there that you can get cheap, but you have to have a good eye and be able to determine grades well. 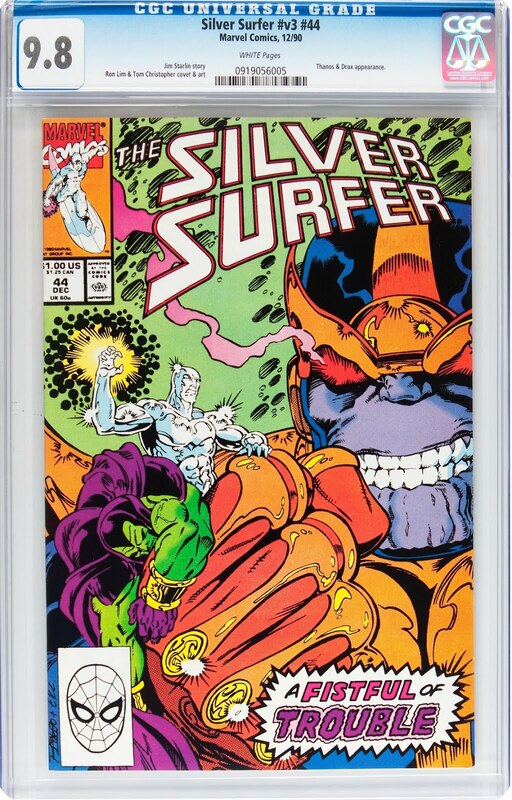 If you misjudge, you could end up paying more than the comic is worth after getting it graded. As always when buying raw, buyer beware. You never know if there's been restoration of any kind done to it. It's less likely with books from the Copper and Modern Age, but you never can tell.